just days after femme fatale leaked, this amazing album comes out, I would easily call it one of the best albums I have ever had the great pleasures of hearing.<br><br>A fever you can't sweat out was amazing, wasnt it? most people that have heard it would agree, well this just blows that out of the park, we see panic! at the disco reach a brand new amazing height with this new edition to their catalogue.<br><br>"The Ballad Of Mona Lisa" served as the first single, and though its not doing that well commercially, I have to say it was a brilliant choice, I truly love this song, it peaked at #1 for me for 6 weeks, and may gather more weeks!<br><br>The big standout of the album is "Let's kill tonight" which I think will have no troubles being a smash hit if released, It's easily better then every song in the top 50 right now!<br>Edit: lol jokes it didnt touch the top 100<br><br>"Hurricane" is a very well done song, the instrumental is so damn catchy, and brendons voice is very clear in this, which he sometimes had once had problems with; another amazing return to form!<br><br>"Memories" is very easy to listen to, and could also very easily be a single<br><br>"Trade Mistakes" is one of the best songs on the album, easily, deffinately a perfectly done song; I would compare it to anything by muse for some reason, very nice!<br><br>"Ready To Go (Get Me Out Of My Mind)" is such a radio friendly song, it wouldnt suprise me to see it make it single, nice to listen to, another brilliant song.<br><br>"Always" almost sounds like rihanna's california king bed at the very start but that disappears quickly haha, I would compare it to one of their previous songs, "northern downpour". It's the closest to a ballad on the album, and its very very good indeed!<br><br>"the calendar" is in my opinion, the worst song on the album, but its still absolutely amazing, and I will happily listen to it by choice and often! I like the music more then the vocals or lyrics of this for reason, great song.<br><br>"Sarah Smiles" is a very happy song, the vocals are very good on this, and it reminds me alot of their "fever you cant sweat out" era, due to the trumpets (?) brought in about a minute into the song, making it very.. I dunno, masquerade-esque in a way haha :P<br><br>"Nearly Witches (ever since we met...)" is the catchiest song on this album, and the best vocals, I would say this is 3rd best, and with just a bit of listening, will become my easy favourite! 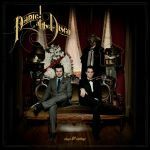 Great return for P!ATD, every track on here is good, great or some are even awesome. Hatte mehr erwartet von V&V. Ein einziges Highlight (die erste Single), sonst ganz ganz viel durchschnittliches. Schade! I don't think it matches their debut album, but it's a solid effort. This is a really great album by Panic! At The Disco! Ballad Of Mona Lisa is the best track though none of the tracks are bad! Sehr gutes Album. Super!!! Sie scheinen wieder mehr zu ihrem alten Stil gefunden haben, welcher mir am besten gefallen hat. A very strong album, one thing I've always loved about this band is their creative lyrics, and that's on show once again here. It took me several years to enjoy Pretty Odd, but this one is a more instantly engaging album, a kind of middle ground between their first two albums. While I'll probably never love a PATD album as much as their debut, this is still a very strong effort. Agreeing with nearly everyone here, this is a fantastic album and yet another great release from Panic!. This is their most cohesive and well-envisioned album so far, whilst it doesn't hit the dizzying eclectic highs that 'A Fever...' did for me, I feel this is the fantastic middle ground between their previous two releases.<br><br>I have to disagree with the first review though. The absolute stand-out track is 'Memories', why it wasn't a single, I'll never know. Also worth checking out are the other highlights: 'The Ballad of Mona Lisa', 'Ready To Go', 'The Calendar', 'Hurricane' and bonus track 'Turn Off The Lights'.